Buttermilk Falls Wedding Photography is what fairytales are made of. The grounds of the venue are exquisite, with multiple opportunities for picturesque Buttermilk Falls Wedding Photography. This image from a Buttermilk Falls Inn and Spa wedding shows the scenery that makes the inn such a sought after venue. 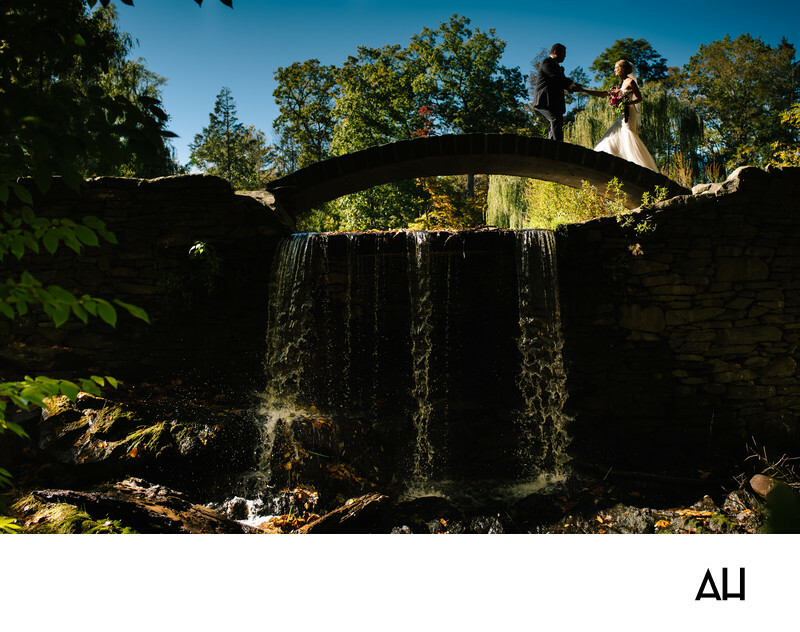 The bride and groom in the photo can be seen standing on a walkway that reaches over one of the venue’s famed waterfalls. At the forefront of the picture, moss and small mushrooms crawl over damp rocks that sit at the foot of the waterfall. Fallen autumn leaves are scattered over the rocks and water, but many of the leaves on the trees have held on to their green coloring. The water gracefully dives off the edge of the stones that are stacked up to create the waterfall and then lands with a sunlit splash on the rocks and pond below. Above the waterfall is a narrow stone walkway for visitors to use to cross over the water. The groom stands carefully out on the walkway, with a hand out to lead the bride over the water. The groom’s expression is cautious and he keeps his eyes on his wife-to-be. The bride smiles back at the groom, love shining in her happy eyes. Her gown trails behind her in an elegant sweep of fabric. It is a tender moment between the couple, with the groom watching out for the bride as she carefully steps out to meet him, taking a chance and trusting that her future husband will always take care of her.